Text-A-Tip is a program that allows students and teachers to report with 100% confidentiality, unlawful, dangerous and unsafe activities that you may see. The number is (408) 695-3859. The purpose of this program is to encourage a culture of learning and safety for ALL of our students. With many dangerous incidents happening in schools both around our nation and in our own state, it is important that we each take an active role in promoting a positive climate. 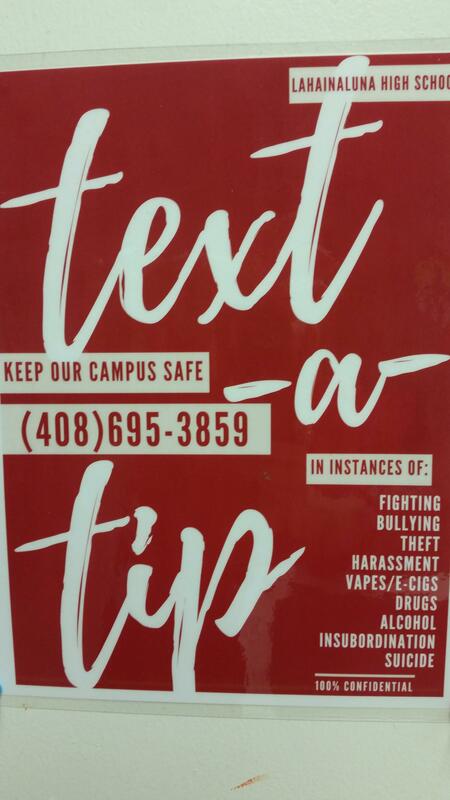 As it says on the poster, we encourage you to text a tip when you see fighting, bullying, theft, harassment, vapes, drugs, alcohol, or insubordination. The way this works is that you would text a tip and someone will respond. When texting a tip, you do not need to give your name, you simply tell us where the incident is occurring, give us a description of name of the violator and we will take it from there. The person will respond to you via text for more information if needed. Please be assured that we will not know who you are when we receive your text - HOWEVER, if the text is threatening, vulgar or false, the Maui Police Department will provide us with a name and the false text offender will be reprimanded. We do not want any of you to feel "forced" to participate in this program, but want to encourage each of you to help us keep our campus safe. We are a community on campus and we are only as safe as the programs and supports we put in place. I ask that you keep an open mind and appreciate that we have this new program. Thank you all for your time, if you have any questions, please don't hesitate to ask your teacher, counselor, security or administrator.